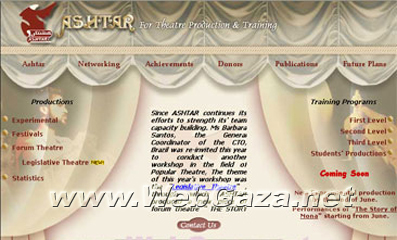 ASHTAR For Theatre Productions and Training - What is ASHTAR? ASHTAR succeeded in turning the place into an ongoing laboratory for research in different theatre techniques and methodologies. ASHTAR aims at making theatre a fundamental need within the Palestinian society, through stimulating cultural awareness, awakening perceptions towards aesthetics and arousing artistic sensibility and taste. It also seeks to build and strengthen cultural bridges with the Theatre World through creative works and ideas. ASHTAR is actively engaged in researching and experimenting with various artistic elements, tools and techniques. It aims at creating a theatre that has the scent of Musk, the color of Amber and the taste of Figs. A theatre that is capable of penetrating all walls including that of the audience’s unconscious.